Article written by Lloyd Horgan – Volunteer at Le Chéile. With all the rush, build up and expectations in the weeks leading up to the Christmas season and the Christmas period itself, more often than not we can forget something of great importance – that is looking after ourselves and our own mental health, and also the importance of looking after those around us who may in some cases just need somebody to lend an ear to listen. A suggestion here would be that giving some well-deserved time to yourself and some of your time to those around you, may in fact be the greatest gift you could both give and receive this holiday season. Although dazzled by the beautiful lights and all that the holidays have to bring this year, we here at Limerick Mental Health Association would like to draw your attention to the topic of ‘self-care’ and the relevance of taking care of yourself. We encourage you at all times, but especially this time of year, to be kind to yourself – and on a wider spectrum, to be mindful of those around you or those less fortunate. It is also worth keeping in mind that while this time of year can be truly magical, it can also be a difficult time for many. This article most importantly addresses the idea of being gentle with yourself whilst developing a level of awareness of how you are really feeling. It also explores how to effectively tune into this awareness and work with the knowledge to perhaps make things that bit easier for yourself and those around you this Christmas. We will look in more detail at developing a self-care strategy and how to effectively implement this plan into your life. To our readers; before you read on, please do not feel that this will be another task on top of that big to-do list you may have this Christmas. 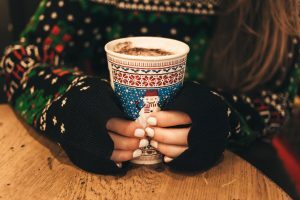 Rest assured that the idea of self-care can be made extremely simplistic and can come down to taking as little as 5 minutes to yourself each day to just be still and ask yourself ‘How am I really feeling today?’ So without further ado, I encourage you to read on as we discuss how to ‘Stay kind to your mind this holiday season’. Take the time to treat yourself to something you enjoy this Christmas. Self-care is often made quite simple and its basic nature is primarily finding what works for you and creating a routine including the things that make you feel good and mentally/physically well!! More often than not, many of us are guilty of repeating the same habits on a regular basis regardless of the negative effect they may be having on our mental or physical health. Self-care involves discovering and removing factors of negative impact from your life, and realising what does not work for you and being able to get rid of these things for the better. On the other hand, self-care involves discovering positive factors and things that work for you and implementing these things into your life. Overall, self-care is about finding a healthy balance (or for want of a better word – a happy medium) tailored to meet and fulfil your needs. It is also important to know that with self-care there is no ‘one size fits all’ and each self-care plan is individual for each and every one of us. Starting small is always key, and I think this is the case with a lot of things in life. Taking the first steps towards the overall goal, being able to be happy and accepting of the fact that things take time, and knowing that it is the initial ripple which will take effect and start it all is of great importance. I guess with self-care it can really depend from person to person and where you are at in your life as to what your starting point is. Although I stated above that self-care can be made ‘simplistic’, I say this carefully in the sense that yes it can be simplistic, but more often than not it will not be that simple or easy. Self-care can be simplistic in the sense that perhaps as part of your self-care plan, it may be that you get out for 15 minutes of a walk everyday and that may sound quite easy. However, getting out for this walk at times may be the last thing you want to do, and in life we are all at times guilty of sometimes ‘giving it a miss’ or saying ‘ah I will go tomorrow’. We then often find ourselves putting it on the long finger for much longer. To find that healthy balance, it can start with something small (it’s all about that first step). Self-care is about developing the ability to put value upon what is good for you and what you truly know has a positive impact upon you as an individual, and upon your mental health – allowing yourself that time to do these beneficial things. Finding that healthy balance can at times be difficult and again I stress that it may take time, but patience here is key. One suggestion would be to reach out to various supports you may have around you who may be able to guide and help you in different ways throughout the initial stages of making that change and creating a self-care plan for your life. Before we go further and discuss creating the plan, again I go back to the phrase ‘finding that healthy balance’. In regards to this phrase and looking at self-care as a whole, self-care can come down to glamorous things such as allowing yourself your favourite chocolate bar or running yourself a nice warm bath. However, self-care more often than not involves things of a less glamorous nature and perhaps more challenging nature such as facing up to a fear, or perhaps kicking a habit like smoking which you know is affecting your life. Although again, self-care really depends upon where you are at in your life, and sadly there is no one size fits all here. Rest assured though, self-care is for everyone and can be effective for everyone when applied properly. 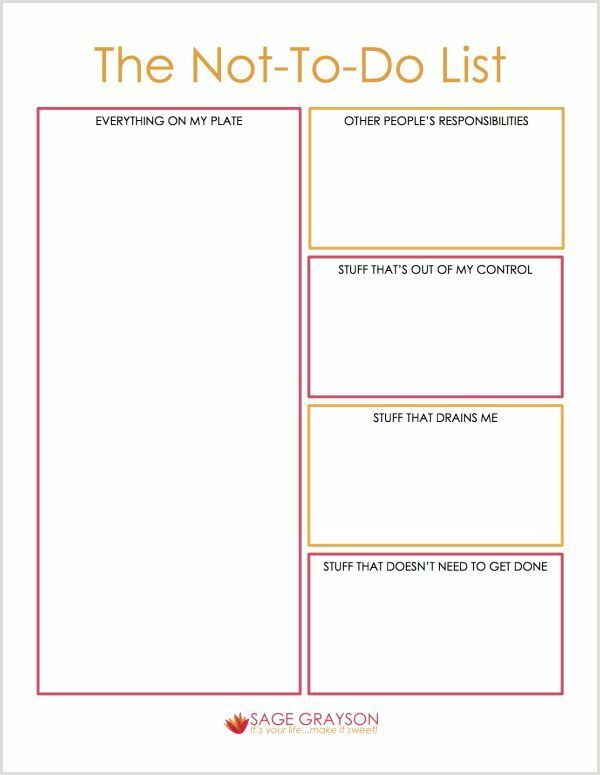 Below is an example of a blank self-care template which can be used for putting together your own personal plan, alongside one which has already been filled out by somebody else which you can perhaps refer to for ideas. This template taken from socialworktech.com is an example for structuring a plan of what works for you in your life! 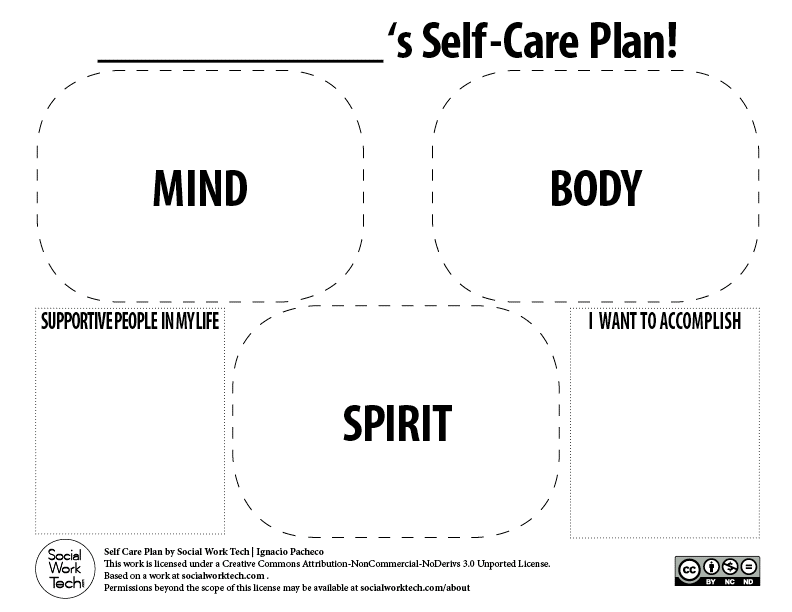 This is a blank self-care plan template that you can use to devise your own plan. This is an example of how a self-care plan may look once it has been completed. Structuring and writing out your plan can be extremely effective, as it can be beneficial and empowering to see the plan in front of you on paper. It provides a sense of clarity and direction around the idea of what self-care will consist of for you. At this point you may be thinking of the things which may be beneficial for you as part of your self-care plan. You may also think you will more than likely be able to remember them going forward, so you may decide to avoid writing them down. However, as part of beginning your self-care journey, I would encourage you to overcome this avoidance and write out the plan as the first step of your self-care as a whole. There are many other self-care plan templates available online from resources such as a self-care blog post and Pinterest. As previously mentioned, it is possible to tailor self-care to meet the needs of just about anyone and there is no ‘one size fits all’ as plans vary and are unique to everyone. 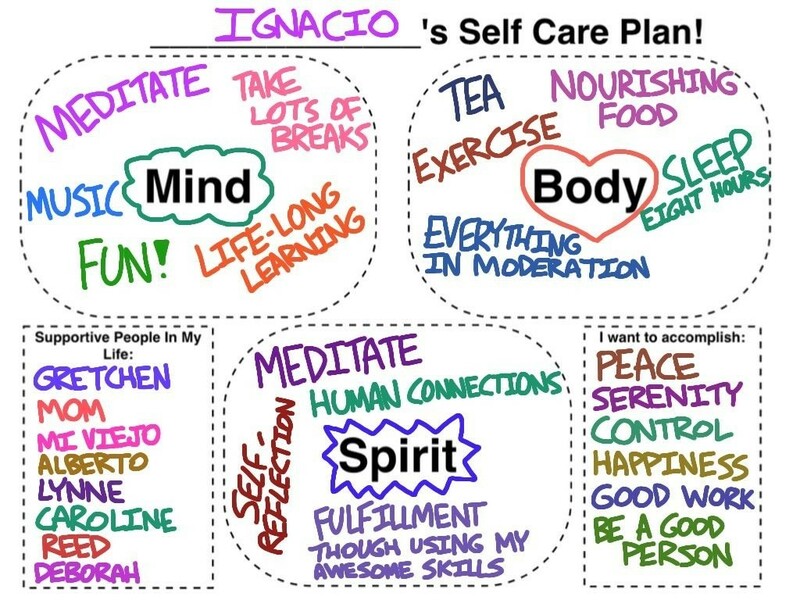 However, when designing and implementing a self-care plan there are often some common themes/areas of focus such as emotional, physical, psychological and spiritual self-care and these can be seen in the templates above. These areas of focus are just suggestions and again depend on what you see fit for your own life. Additionally, referring to a self-care starter kit may be beneficial in the early stages of your self-care journey! Self-care is about taking responsibility. It isn’t always going to be glamorous, and it depends on the lengths and extremes you are willing to take. It depends on what you are willing to sacrifice and what you are willing to prioritise in your life so you can live a balanced more effective life for the benefit of both your mental and physical health. Self-care is creating a life which you don’t always want to run away from, a life which is comfortable and acceptable, meeting all of your needs. Self-care isn’t meant to be something which you only resort to in times of struggle in hope that it will fix the situation. It should be a way of life and be implemented into your everyday to prevent that time of struggle from occurring in the first place. Self-care is not an intervention method, but rather a means of prevention. It is true that self-care can involve enjoyable things such as having that slice of well-deserved cake or that glass of wine which helps you ‘switch off’. However, self-care may not always be as glamorous as you expect it to be. It should not always be about ‘switching off’, but more about being effectively able to stay switched on in a life which works for you and makes you happy. Self-care may involve things such as removing toxic relationships and friendships from your life or perhaps quitting smoking because although you feel it eases stress at times, you also know that it is causing you to be anxious and worry about your health. It involves realising that some things which may have previously worked for us or had relevance in our lives, may just not be good for us anymore. Self-care is getting out for that walk or run or perhaps going to the gym. It is getting that training session in at a time when you feel like you really don’t want to or feel that you ‘can’t’, but in the back of your mind you remember the importance of exercising to get that feel good aftermath. Self-care is having the courage to take responsibility for your own life and putting value on yourself and the quality of the life you live. Regardless of how difficult it may be at times, self-care is something to be patient with and work with to reap the benefits of. Ultimately, self-care is realising your full potential and using this to live a life true to yourself. Self-care is making choices for the long-run, not just for today. This blog post on Thought Catalog provides further insight into how self-care is not always glamorous. Unlocking your true potential; it is something which we all hope and dream for – well it is possible! Self-care provides a structured framework to assist you in reaching your full potential. It enhances your capability to do the things you want to do. On the other end of the scale, it aims to increase your potential and likelihood to do the things that sometimes you don’t want to do! The overall goal of self-care is ‘personal development’ – developing as a person during a process of constant growth and learning. So to conclude, I encourage you to consider how implementing a self-care plan into your life can literally be life-changing! Start small and take your time with the whole process – you will get there and patience is key! Once again, I know at this time of the year our minds are often distracted by all that the season brings and all Christmas expects of us. Please remember to be gentle on yourself this year. Even the elves in the North Pole need to take a break and have some quality ‘ELF-CARE’ every now and then…get it… elf-care?? Without any further terrible Christmas dad jokes to make you cringe, I would like to thank and congratulate you for taking the time out for yourself to read this post. I hope it will be the beginning of a very positive self-care journey for you, helping you to put the well-deserved ‘I‘ in Christmas this year. On behalf of myself and all here at Limerick Mental Health Association, I would like to wish all our readers and members of both Le Chéile and Limerick Mental Health Association a very safe and Merry Christmas, and a Happy New Year! This entry was posted in #LiMental, Le cheile, mental health, self help, Self-care and tagged christmas, holidays, le cheile, limerick mental health association, mind yourself, routine, self-care, self-care introduction, self-care learning, self-care plan, take care by Jamie Davern. Bookmark the permalink. ← Previous Previous post: Can I help others through creative writing?